Clergy and laity from Kerala would join in Vatican to witness the event. Two Kerala-born Indian Catholics will be declared as Saints in Vatican on November 23. 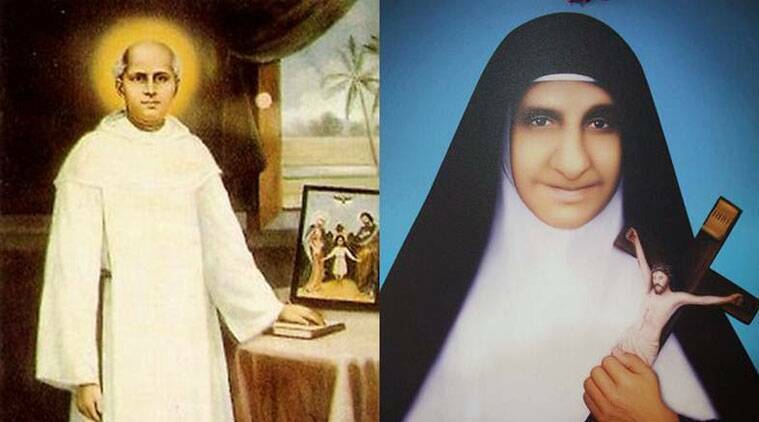 Fr Kuriakose Elias Chavara and Sister Euphrasia, both now in the category of Blessed which is a stage closer to sainthood, would be canonized into the league of saints by Pope Francis in a function at St Peter’s Basilica in Rome. Clergy and laity from Kerala would join in Vatican to witness the event. Chavara, who lived in the 19th century in Kerala, is reckoned as a social reformer and visionary priest. Chavara was declared as a blessed in 1986 along with sister Alphonsa, who was made a saint in 2008. Chavara is credited with introducing several reforms in Kerala and Syrian Catholic Church as well. He was was born in 1805 at Kainakari in Alappuzha district. After religious studies, he was ordained as a priest in 1829. Since then, Chavara had continuous interventions in religious and intellectual realms of life until death in 1871. As a priest, he tried to popularize the Sunday sermon in churches and retreat for laymen. One of the most significant attempts was founding of the first Indian congregation for men, which was Carmelites of Mary Immaculate (CMI), and the women congregation Carmelites of Mother Carmel (CMC). In 1846, he started the first printing press at his monastery at Mannanam in Kottayam. Later, the press was used for bringing out the first Malayalam daily Nasrani Deepika at the behest of Chavara. In 1861, Chavara was made the first vicar-general of the Syrian Catholic community in Kerala. As the head of the Church, Chavara prevented the laity from schism in the community and retained them under a single fold. He also started the system of seminary for training priests, instead of novices attending classes under various individual teachers. His pioneering contribution to Kerala society was “school along with church’ . In 1864, he had issued a decree to start pallukoodam (school) along with every palli (church). This direction, later, led to the establishment of schools beside a church, a practice continued even now. Chavara started a special school for weaker sections in society and opened the first boarding school for girls at Koonammavu near Paravoor. Later, he also took steps for opening destitute home for orphans and aged people. When Syrian Christians in Kerala were under bishops from foreign missionaries , Chavara wrote to Rome for the need for making local priests as head of the Syrian Church. This move later led to the formation of separate dioceses for Syrian Catholics. Chavara died in 1871 and was buried at St Philomina’s Church at Koonammavu in Ernakulam district. Later, his moral remains were taken to the monastery he had established at Mannanam in Kottayam. His canonization process was started in 1957 and was elevated as Venerable in 1984 as the faithful started reported about miracles received at the intercession of the late priest. In 1986, he was declared as blessed by Pope John Paul II during his Indian visit. The final sainthood is conferred after acknowledging a miracle happened at the intercession of the blessed. In the case of Chavara, the Church recognized the curing of a congenital deformity of a little girl named Maria Rose, a native of Pala, in 2005. While Chavara had an eventful life through his interventions in Church and Kerala society, Euprasia had her life confined within the convent. She led a life dedicated to prayer and sufferings. Euprasia had been a member the Congregation of the Mother Carmel, a first women congregation established by Chavara in 1866. Known as Rose before becoming a nun, Euphrasia was born in 1877 at Katoor in Thrissur district in a rich family. Leading a pious life from early childhood, Rosa offered virginity to God at the age of nine. She joined in the religious order of Congregation of Mother Carmel and became a nun in 1898 and took the name Euphrasia. She had a led a very secluded life, spending most of her time in the convent chapel at Ollur in Thrissur, where she had spent a major part of her religious life. In her life time, Euphrasia was called a praying mother and she was known as a living saint among nuns. The frequent letters she wrote to her spiritual father Bishop John Menachery shed light on her saintly life. “There was not a single day in by life not to be afflicted for God,’’ was one of her prayers, according to her writings. At the age of 75, she died in 1952 and was buried at Ollur. Years later, the tomb of the nun, who prayed to God for a silent and secluded life, turned to a pilgrim center for the faithful. Several miracles were reported from the faithful through the heavenly intercession of Euphrasia. As the Church began the procedure for her canonization, Euphrasia was declared a venerable in 2002. In 2006, she was elevated as Blessed. In the same year, seven-year-old boy’s cist was cured, which was considered by the Church as a miracle happened due to the blessed nun’s intercession. In April this year, Vatican acknowledged the miracle, leading to her canonization as a saint. Lived in the 19th century in Kerala, and is reckoned as a social reformer and visionary priest. Was declared Blessed in 1986 along with sister Alphonsa, who was made a Saint in 2008. Was born in 1805 at Kainakari in Alappuzha district, and ordained as a priest in 1829. Credited with introducing reforms in the Syrian Catholic Church. Popularized the Sunday sermon and retreat for laymen; founded the first Indian congregation for men, the Carmelites of Mary Immaculate, and for women, the Carmelites of Mother Carmel (CMC). Started the first printing press at his monastery at Mannanam in Kottayam, which went on to bring out the first Malayalam daily, Nasrani Deepika. Pioneering contribution to society was “School along with Church” — in 1864, he decreed that every palli (church) must have a pallukoodam (school). The practice continues to this day. Chavara also started a special school for the weaker sections. Lived in the 19th and 20th centuries, and led a life dedicated to prayer and sufferings. Was a member of the Congregation of the Mother Carmel established by Chavara in 1866. She was born in 1877 at Katoor in Thrissur district in a rich family, and was known as Rose before becoming a nun. She joined the CMC and became a nun in 1898, and took the name Euphrasia. Led her life mostly in the convent chapel at Ollur in Thrissur, and was called the praying mother and known as a living saint among the nuns. The frequent letters she wrote to her spiritual father Bishop John Menachery shed light on her life. “There was not a single day in by life not to be afflicted for God,” was one of her prayers. She died in 1952 at age 75, and was buried at Ollur. Years later, the tomb of the nun, who prayed for a silent and secluded life, turned to a pilgrim centre. Several miracles were reported from the faithful through heavenly intercession of Euphrasia.